Striker Ice Climate Suit is the most technologically advanced ice garment on the planet and the flagship of our lineup. Find us a problem, and Striker delivers solutions in the form of a revolutionary ice apparel. Our Hardwater Suit provides rugged protection from the elements. Super tough 600D Endura outer shell with enough fixed insulation to endure the elements. With a warmth rating of 9, our Hardwater Suit is the perfect accompaniment to mere pail on the ice. Our Hardwater Suit pretty much eliminates the need for a shelter. 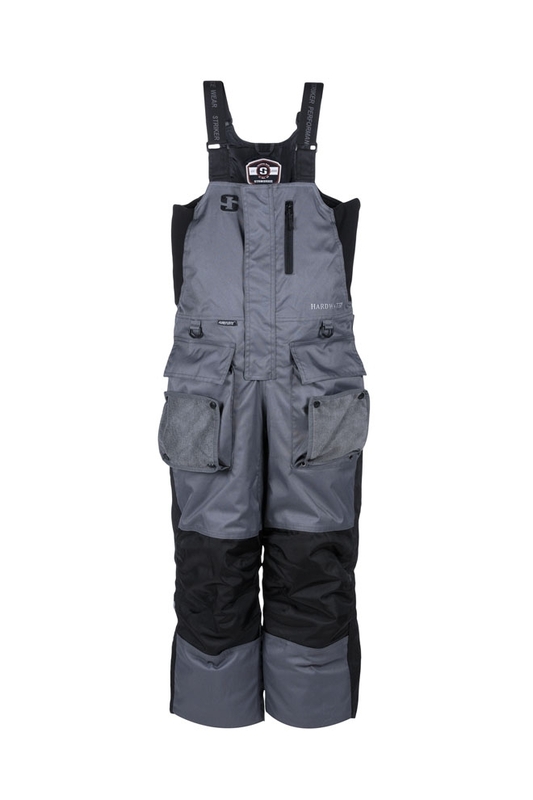 Hardwater bibs are your get-to-work armor. You strap them on before you go to work, and you don’t take them off until the job is finished. They combat dirt and rocks at the landing, and fight off water and ice on the lake, all while keeping you warmer and more comfortable than your buddies. Hardwater bibs are smart tech, wrapped in a 600D Endura shell that allows you to never hesitate when hooking up a sled, kneeling down in slush, or fixing an ATV in the bitter cold. Rest assured, like all of our bibs, there’s enough SUREFLOTE™ flotation inside to buoy even the largest of ice-heads. Wear them fearlessly, use them confidently. Sizing Note: Please refer to the size chart for sizing instructions. Generally, this item runs about a half size larger than normal sizing. Staff Note: This all time favorite had its beginnings with the original 2012 "Heavy" ice suit. It has evolved into one of our most tech-featured bibs, with the ruggedness of a 600D Endura shell and our super tough but comfortable snakeskin knees. This is the style of choice for slower movers, "mature" ice fishermen, and bucket sitters. HardWater is nicknamed "the furnace".